Cracks and chips to your windshield are an incredibly common occurrence. But more often than not, they are easily repaired. The thing is, if you could just avoid them altogether then you wouldn’t have to go through the hassle of getting them fixed. And while it is impossible to avoid the wayward rock bouncing on the highway or the tree branch that falls on your windshield during a freak windstorm, there are steps you can take to protect your windshield. 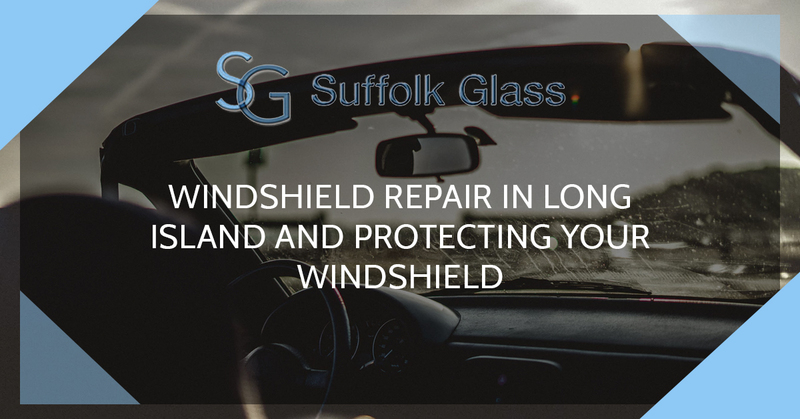 Suffolk Glass, your windshield repair service in Long Island, offers tips to help protect your windshield from damage. Not parking your vehicle under trees and away from the baseball fields at the park gives you more control over what happens to your windshield. Sure, you want to park under that big, shady tree to keep your car out of the beating sun, but there is a risk when you do. It would also serve you well not driving behind gravel trucks. It’s not a good idea to take your anger out of your car doors. You will only feel worse should you happen to crack your windshield. And if you have a habit of slamming car doors shut know that repeated car door slamming can weaken your windshield. Do your best to park your car in the shape when it is hot out so your windshield doesn’t heat up too much. It is also a good idea to crack your windows to keep things a bit cooler. When you get back to your car after a day at the beach in 90 degree heat, don’t blast cold air from your air conditioning on the windshield. You should allow your car to cool down slowly. Extreme drops in temperatures can crack glass. So your goal should be to keep your windshield at a steady windshield. It is not a very good idea waiting to replace your windshield wipers. Waiting for the rubber to peel away from the metal is simply too long. Once the rubber has peeled, your wipers can damage your windshield. It is also a good idea to keep windshield washing fluid in the reservoir as the fluid helps your wipers to work better. The faster you drive, the more likely that any object hitting your windshield will do damage. Mind the speed limit. You can minimize the risk of damaging your windshield by being a safe driver. You can slow down on gravel roads and pull over and find shelter in the event of a hailstorm. Should you suffer a chip or a crack on your windshield, get it repaired as quickly as possible. If the problem is caught early enough, you probably won’t need a windshield replacement. Many types of windshield damage are repairable. But you need to call Suffolk Glass for fast repair right away if you spot windshield damage.